The history of bowling is one of those notable glimpses back into American culture. I mean, who didn’t like bowling. Bowling has typically had two separate groups of admirers. There were league bowlers and social bowlers.Then we had kid bowling (with a party flare) and adult bowling. The adult bowling was where the cocktail lounge served the intermediary between mediocre bowling and a good time. 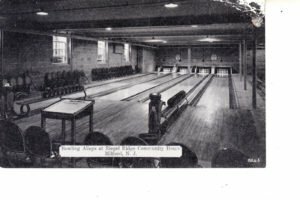 In this article, we step back in time back to the beginning of bowling in the Somerset Hills. 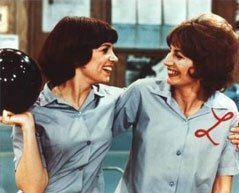 Who doesn’t remember Lavern & Shirley at the bowling alley or watching the Professional Bowlers Association (PBA) and Earl Anthony on ABC’s Wide World of Sports. Bowling Shirts were all the rage. The 50’s-70’s were the bowling era. 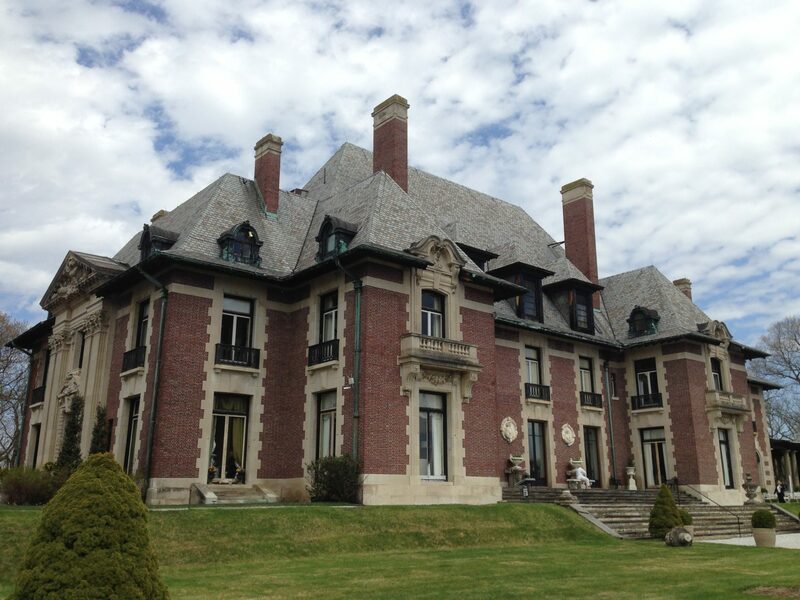 So to be a local in the Somerset Hills in northern Somerset County New Jersey, the purpose of this article comes more so about what used to be. Sadly, there’s no longer any bowling alleys in the Somerset Hills. 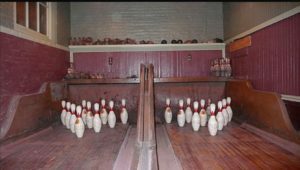 You have to go to Morristown, Hanover, or Green Brook for the bigger alleys or to places like Garwood Lanes for a local time if you want to knock down some pins. 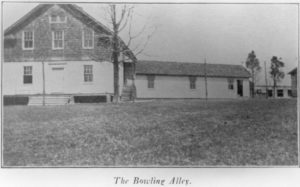 America’s oldest surviving bowling alley was built in 1846 by businessman Henry Chandler Bowen in a carriage barn at his Gothic Revival-style mansion, Roseland Cottage in Woodstock, Conn., and enjoyed by President Ulysses S. Grant during a visit on July 4, 1870. “This used to be a workingman’s country club,” says Joe Zainea, 78, about the downtown Detroit, Mich., bowling center that his father bought in 1946. A form of bowling has been played since 3200 B.C., as evidenced by objects uncovered from an Egyptian grave. Variations of pin games were played in various countries, and immigrants brought their versions to America. New York City’s oldest park is named Bowling Green because the area was used for lawn bowling matches by Dutch colonists during the 1700s. 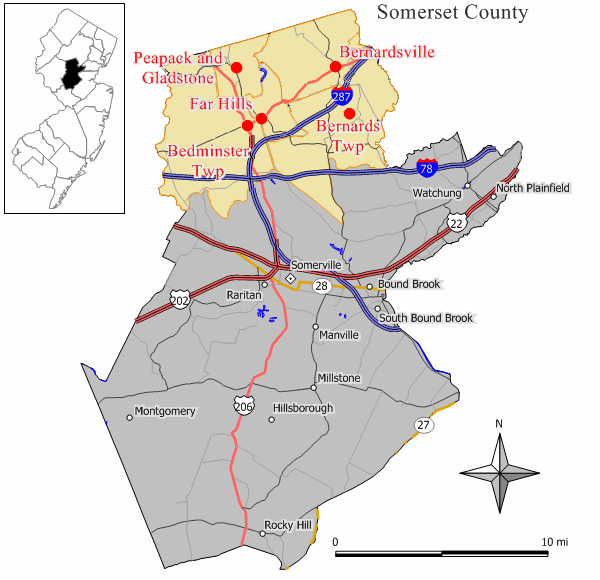 There is a history of bowling in the Somerset Hills including Bedminster, Bernards Township, Bernardsville, Far Hills and Peapack/Gladstone (aka the Somerset Hills). The Somerset Recreation Bowling Alley is now Bernardsville Hardware. We start with the last bowling establishment in the Somerset Hills. It was in operation almost 86 years after the first bowling alley opened in the area. Back on March 12, 1949, about 250 people attended an exhibition that marked the opening of the Somerset Recreation Bowling Alleys on the corner of North Finley and Route 202 in Bernardsville. Mayor Catesby L. Jones praised the new alleys as “beneficial to the community” and stated that they would attract church groups because they would not serve liquor. Opened by Joseph Allenzo in 1949 at the Bernardsville location that was known as Blazure’s Corner. Mario Allenzo, the son of Joseph and Grace Di Tomaso Allenzo, later took over business operations. Mario graduated from Bernards High School in 1933. 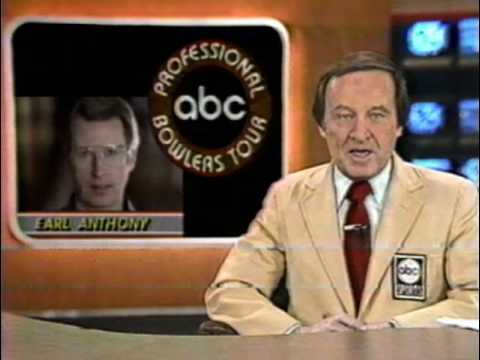 He was a member of the Professional Bowlers Association and the American Bowling Congress, and bowled several perfect 300 games and was a true lover of the game. Interesting when you look at these teams. 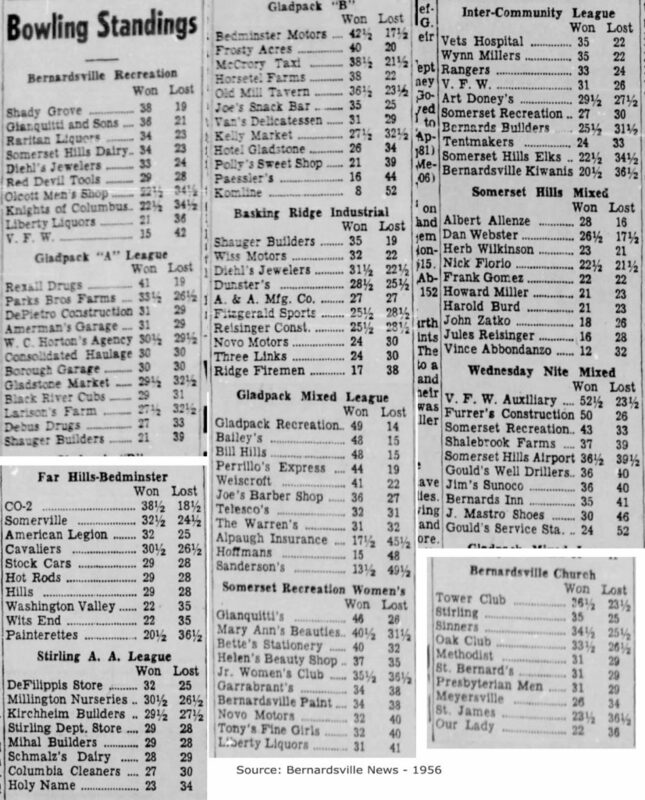 It’s been about 61 years since this article, and only two remain – Bernards Inn and J. Mastro Shoes (both in Bernardsville). Time changes everything! There were 16 lanes. Before 1956, you could even get a job as a “pin boy”. While humans usually no longer set the pins, a ‘pin chaser’ , or ‘pin monkey’, often was stationed near the equipment to ensure that it was working properly, and to clear minor jams. Then, in 1956, an automated pin setting system was installed and another job had lost out to a machine. The AMF family of pin spotters, first marketed in 1952 were the very first ones ever used in quantity in the industry. They have changed little since the mass-produced version.But sadly, bowling ended at the site in 1985 after 37 years in the business. 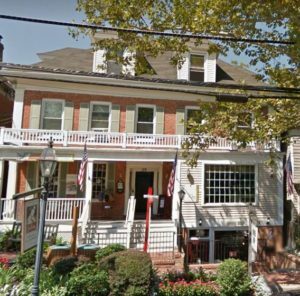 The site is currently the home to Bernardsville Hardware. In 1954 the name was changed to Gladpack Recreation under new owner Polly Gallo. Announced on September 12, 1940, Harold Vliet of Gladstone opened a new recreational facility with six new lanes in a newly constructed building. It opened on a Thursday night by manager Paul “Polly” Gallo. The thought was that league play was expanding and in fact it was. 5 new teams were formed and the Gladpack league had a new venue to play. In 1954 ownership shifts to Paul Polly Gallo along with a new manager A. Daniel D’Ambrosio. 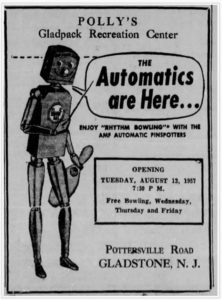 On August 13, 1957 Polly’s Gladpack Recreation Center reopens with automated pin setting. On October 8, 1964 the alley was gone. A massive fire burned the facility to the ground. It was recorded as one of the largest fires in the area’s history. Another bowling alley we found was at a Catholic School in Bernardsville. We’re still researching. Records indicate it was still operational in 1938. 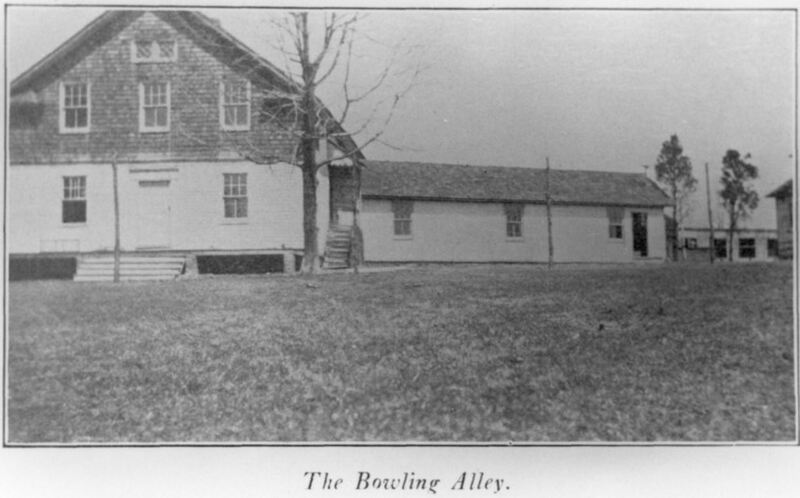 The first bowling alley in Basking Ridge was in the library as early as 1909. 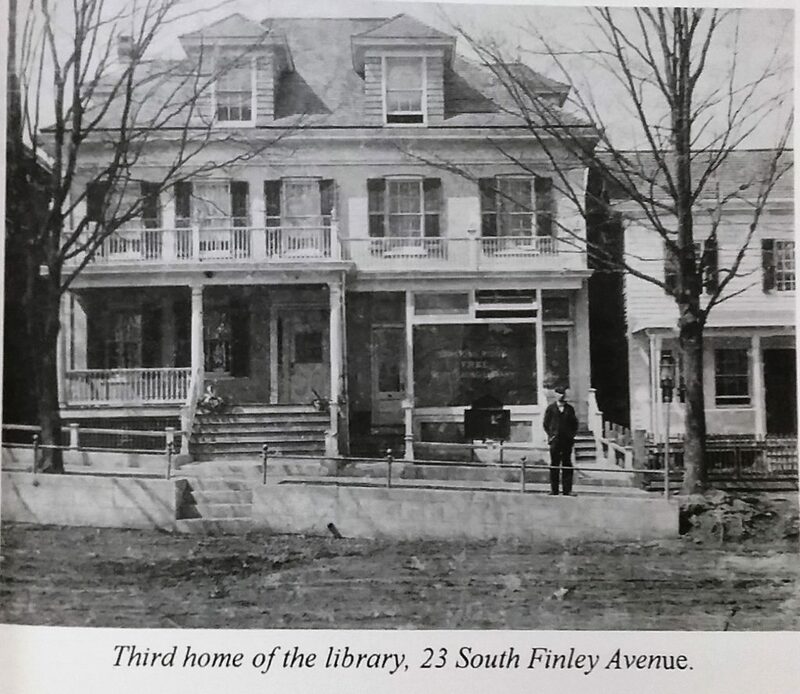 It was during this time in 1910 that the Bernards Township library was moved from 31 Main Street from Misses Mary and Elizabeth Barkalow’s, to an old house at next door at what was 23 Main Street (now 25 S. Finley Avenue), owned by State Senator and nearby Bernardsville resident Samuel S. Childs. Main Street changed to Finely Avenue in 1912. This was the Bernards Twp. library’s third home. Mr. Childs remodeled the building for use as a library, making a room with a small stage for community use and later adding two steel bowling alleys in the basement. You see, Senator Childs was also an avid bowler. 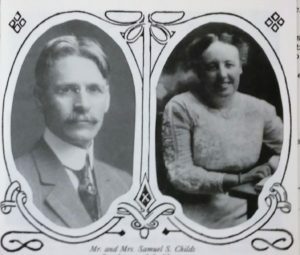 Senator Childs was also the owner of the infamous Childs’ Restaurant chain, having over 125 locations and know for being the inventor of “quality industrialized fast food”. He presented the Basking Ridge Free Circulating Library with two sets of pins and three balls for the alley, feeling that money could augment the thin coffers of the treasury. The alleys became a large part of the library’s operation. Mr. Childs continued to supply the bowling pins and balls when necessary, and underwrote alley maintenance. Bowling alley fees were very welcome throughout these years. Entries in ledgers cite $82.02, $48.00, $36.80, $70.95 and $64.55. 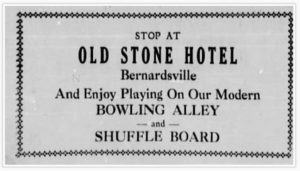 The Childs were responsible for bringing bowling to Basking Ridge but they were 2nd in Bernards Township (Bernards Inn). Records indicate that in 1912 Basking Ridge Amusement Company installed a movie theater in the same location, so it is possible that the Library might have been running at two locations (this one and also up the street at 2 North Finley). Writings also show that the Library officially moved in 1931 after a renovation. So it’s not clear who was running the alleys during this period. 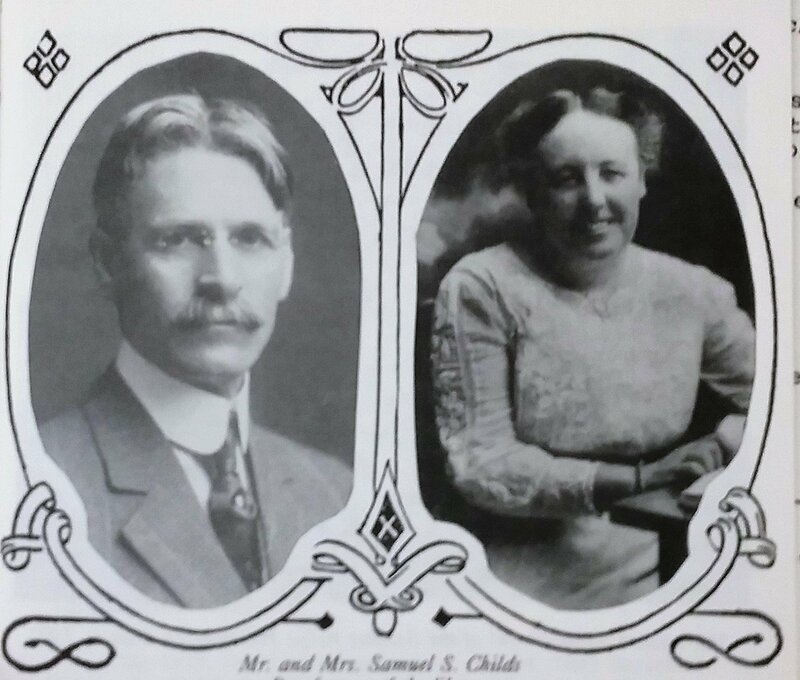 It’s assumed it was still Samuel Childs, but he died in 1925. 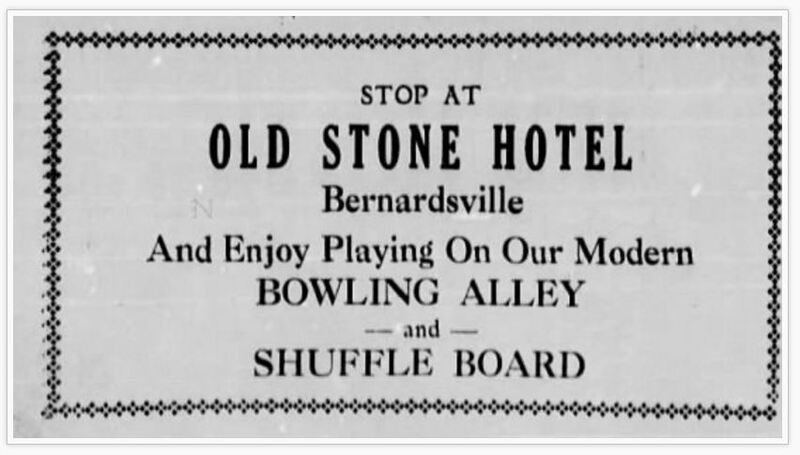 In 1919, the regulations for pool or billiards rooms were strict in Bernards Township. No parlor was allowed within 500 feet of a church or school; no one under 18 was permitted to play there or congregate unless accompanied by an adult; card playing was prohibited; and billiard halls had to be on the street floor and fully visible from the public thoroughfare. 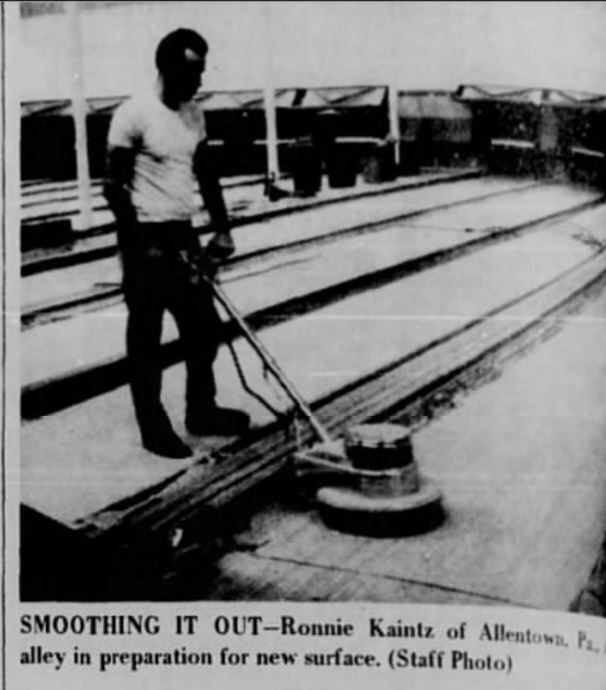 Back then you needed a license to have a bowling alley in Bernards Twp. $2 per alley. 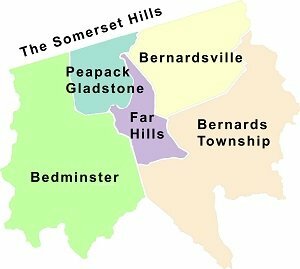 Back in 1919 when this ordinance passed, Bernardsville was still part of Bernards Twp. 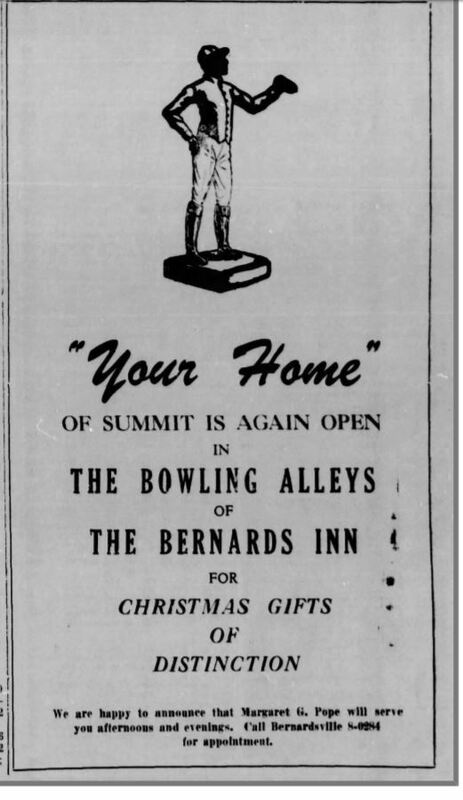 The ordinance initially applied to two bowling alleys; the Bernards Inn Alleys and the Library Lanes (also later known as the Ramsdale building) at 25 S. Finley Avenue from the early 1900’s until about 1940. The Bernards Township Township Administrator Bruce McArthur said his father worked there as a manual pin-setter. After, the library left this location and moved up to the corner of West Oak and Finley. There is evidence that the Bernards Township Library may have been working out of two locations and ultimately after Childs death, the building switched from being a library to what then became the Ramsdale Building. On July 10, 1930 Thomas Ramsdale and Joseph Wolfe were granted permit to create two bowling alleys. The bowling alley opened the following week. Nothing remains from the Library Lanes of Basking Ridge. 25 S.Finley Ave. is now home to Ridge Pizza. By 1939 they were just called the Ramsdale Alleys. The “Industrial Bowling League”, one of the areas best know leagues played there a number of times. 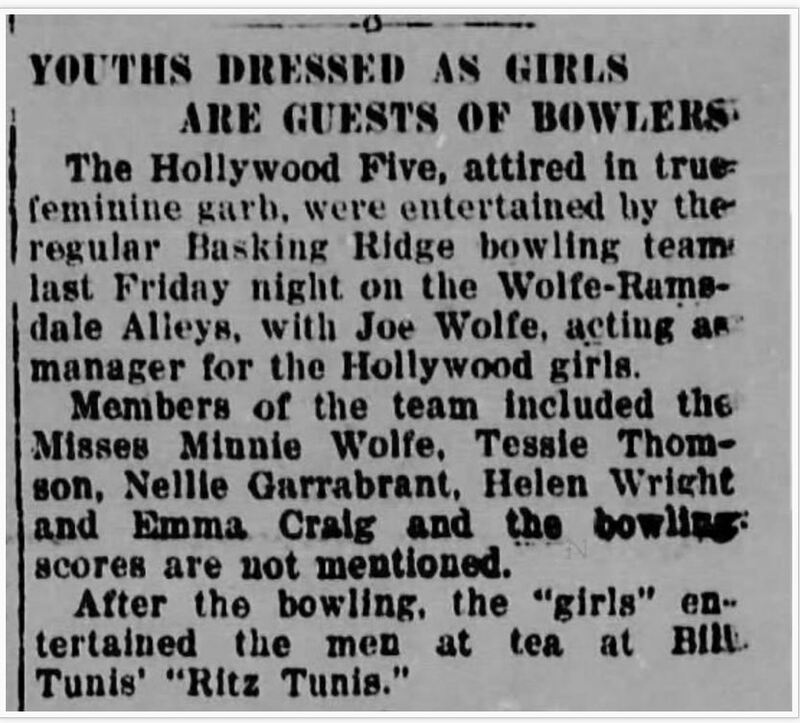 For the first time, there were indications that the league play was strong, but public bowling and parties were starting to show interest in the early 1940’s. In later times, Edwin G. Totten’s Village Fountain (1949) replaced the bowling alley. Now there’s a restaurant on the first level, a barber on the lower level, and living space on the 2nd floor. In 1939, there was nearly a bowling alley war in downtown Basking Ridge. In May 1939 , township resident Joseph Allenzo received a permit to build a bowling alley on South Finley Avenue near West Henry Street (Wells Fargo Bank location). Later that month, Thomas Ramsdale said he was considering plans to increase his number of bowling lanes from two to six at 25 S. Finley Avenue. But Allenzo never built his project in Basking Ridge. Instead, he built the Somerset Recreation bowling alley on Route 202 in Bernardsville, which operated from 1949 to 1985 before being converted into a hardware store. The South Finley site was developed as a bank in 1953 and currently is the home to Wells Fargo Bank. 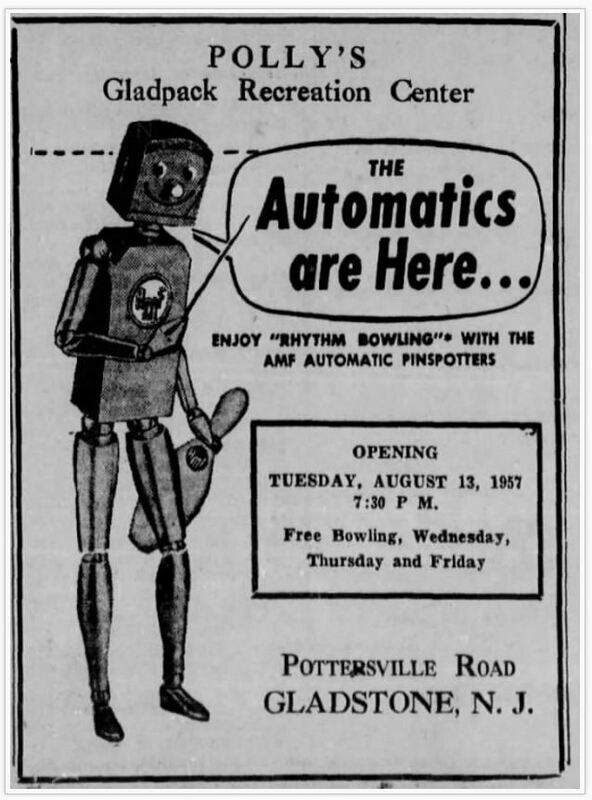 The research continued and in 1939 an ad showed up for yet another bowling alley. This time it was at the famed Old Stone Hotel in Bernardsville, just off Olcott Square. 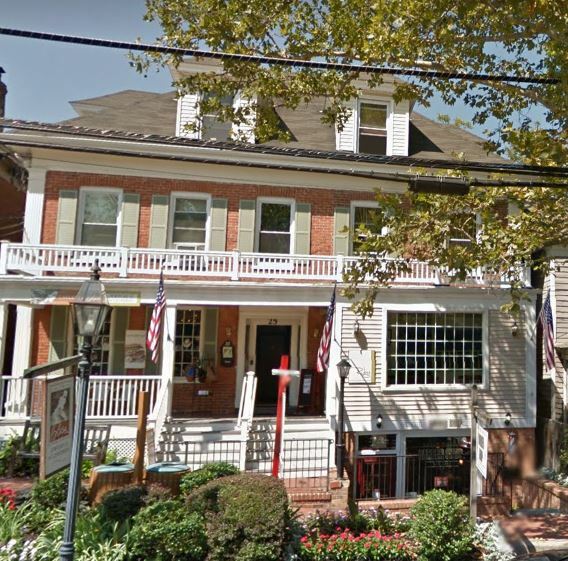 The stately Bernards Inn in Bernardsville was the creation of brothers Fred E. and Frank A. Ballentine and was the first in town to have a bowling alley from 1906 until 1948 when it was named the Bernards Inn Bowling Alleys. Started with two lanes, owner Frank Ballentine wanted to expand to 4 lanes in 1922 in the basement. 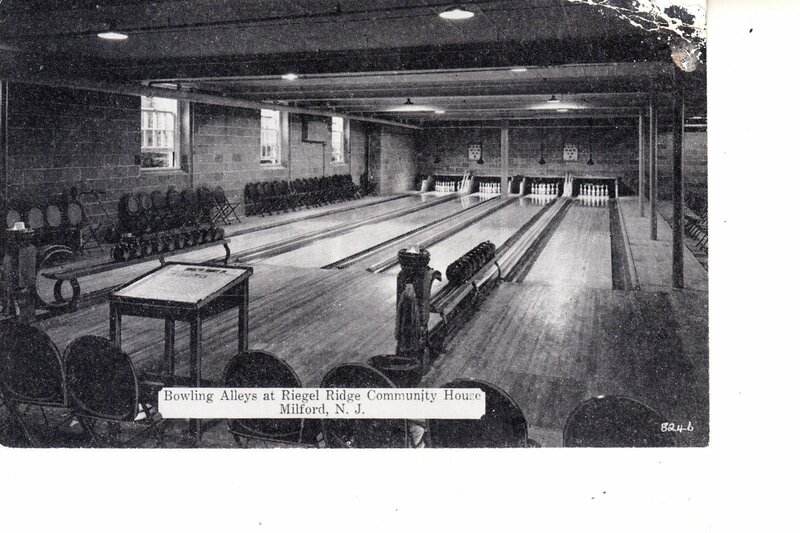 This is a similar bowling alley in Milford, NJ in the 1930’s . 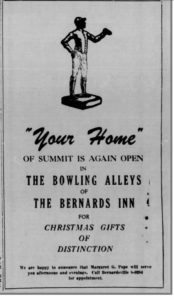 In 1931 there was a big upgrade at the Bernards Inn as they introduced on February 19th the new “Bowling Alleys and Billiards Parlor” in a large ad in the local newspaper along with a big relaunch on February 28, 1931. Don’t forget you could get a great steak dinner for $1.25. Ed Dargel was the Alley Manager at the time. On March 12, Mr. Dargel announced that a “ticket to New York and to the Capital Theater would be given to the person rolling the highest score for the week.” A hat was given away from a local haberdasher Joseph Goldsmith for the highest score of the month of March. Leonard P. Scott of Mt. Airy Road, won the trip with a 223 score. Louis Spagnolo won the hat with a score of 224. 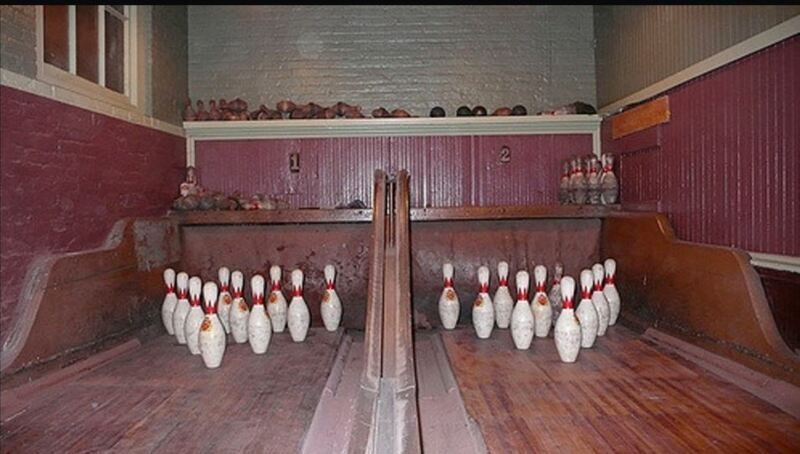 In 1948 during yet another remodel, the lanes were converted to meeting space, never to be seen again. 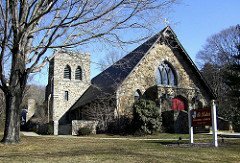 There’s a record noted in the November 1910 issue of “The Churchman Vol.90) stating there was a bowling alley at St. Lukes Episcopal Church & Chapel in Peapack. 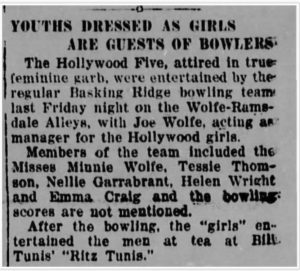 The record stated it contained bowling alleys as early as July 3, 1904. We’re still digging and wanted to let you know that there was an indication of a second Peapack bowling establishment. Our story ends (or starts) in 1899 in the Pluckemin section of Bedminster at an infamous hotel and spa known as the Kenilworth Inn and Spa. The Inn was more than just an Inn, it was a destination. A spa with healing springs and all kinds of retreat activities. In September 1895 the modern standardized rules for ten-pin bowling were established in New York City and soon bowling alleys began popping up around the country. 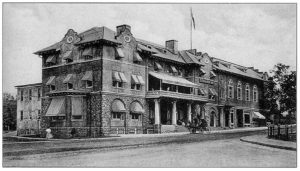 The bowling alley that was part of the Kenilworth Inn opened in 1899, this hotel featuring a 20 room house was on the site of Jacob Eoff’s original inn. Eoff was one of the original revolutionary war founders of Pluckemin. 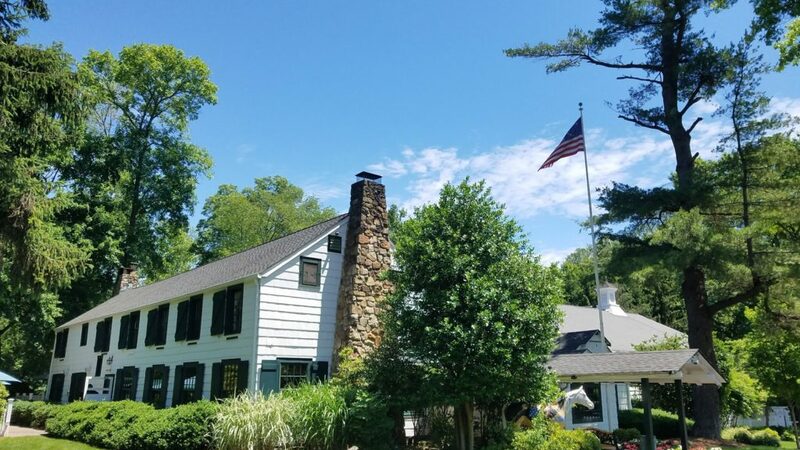 Built in 1899 by James Brown Jr., the Inn was a 20-bedroom health resort that featured a casino with dance floor, bowling alley, several cottages and a nine hole golf course that was open from mid-May to Nov. 1. 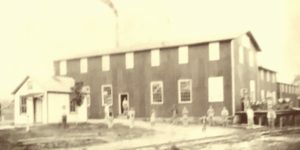 There was a combined coach barn and stable. An ad offered for $3 a day: excellent food specialties by season, golf, dancing, and a locale free from malaria. 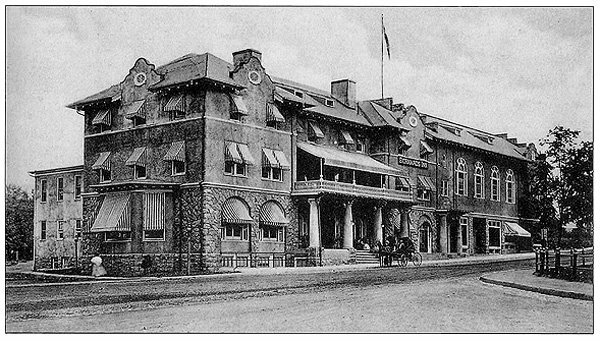 Although gambling was permitted, the hotel was on the temperance plan, with bottled water from Brown’s springs served. A liquor ban was lifted in 1904 but the Inn still did not survive. Noted on August 7, 1924 the New Jersey State Police, who had leased the property in 1923, set in motion to convert the bowling alley to a pistol range. The building “burned to the ground” on April 25, 1928, causing a loss estimated at $40,000. The blaze was thought to have been caused by a faulty chimney. Froh Heim in Far Hills had a two story recreation building complete with bowling alleys, glass roofed tennis court, game rooms, living room, and even a Turkish Bath are on the Moorland Farms. The inside of the estate was said to also contain a full size teepee, and a room with 60 silver grey wasp nests on the ceiling. Blairsden in nearby Peapack when listed for sale, the “Talking Points” included: Over-the-top amenities include a two-story Chanel-themed dressing suite, an indoor pool, a hair salon, a home theater, and a bowling alley. As the internet expands, we’ll certainly look to expand this story. But the fun part is learning about what was…. we always appreciate any feedback or back stories you might have to offer. Feel free to drop a note or add a comment. Photos always welcome. Under Review: An industrial fire in Peapack was reported by the Bernardsville News in a small story on June 14, 1923. 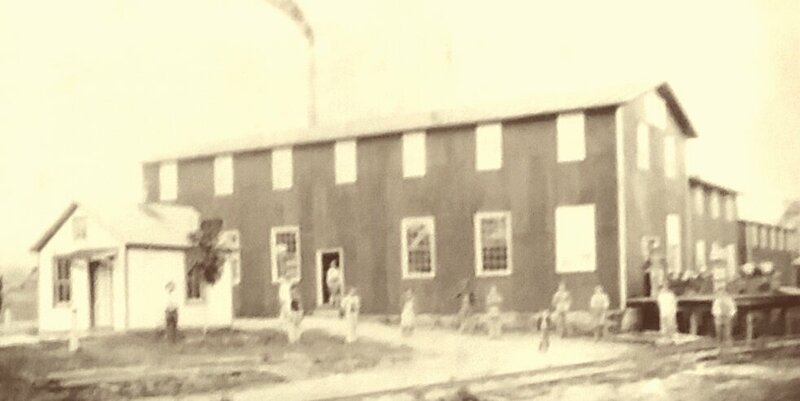 The Ludlow hub factory, situated opposite the Peapack railroad station, had been built about 30 years earlier for the manufacture of wagon wheels. The Ludlow Hub Building circa 1913 was later known as the Horswell Corporation, a electrical component manufacturer.